Ancienne Style Coarsely Ground Mustard. Later – 4 tbs Any local Mustard Paste (French/American) style, available. In a glass or stainless steel bowl, place all the ingredients of AA) and ensure all the mustard is wet, by pouring just enough water, till the seeds are completely covered. Mix and then cover with a lid or aluminium foil. Keep for 3 to 4 days, checking daily, mixing and ensuring that the mustard is still just covered in liquid for the 1st two days. During this time, the seeds absorb a fair amount of liquid and will swell up. Once it has absorbed all it can, the liquid will stay at the bottom. Taste the marinade and make sure that its sour and tarty. Depending on the vinegar used, one may have to add more, or even add Citric Acid Crystals to taste. Keep aside in a cool and dark place. After 3-4 days, this can be ground in a blender. 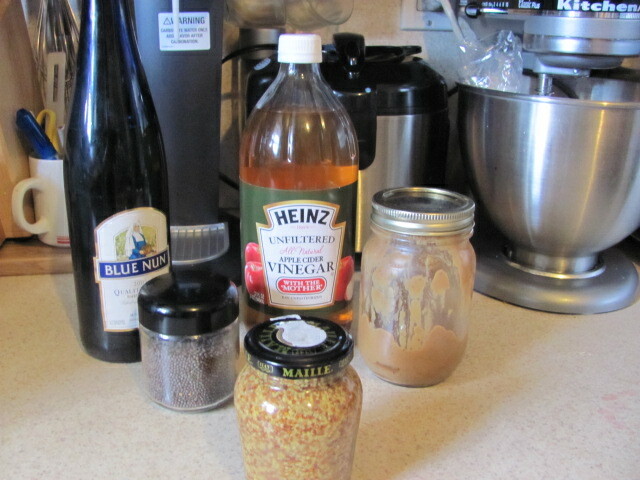 Grind the mustard in two or three lots in the blender jar. One lot should be finely ground with the local Mustard Paste in B. (This gives body to the final sauce). The 2nd (and maybe 3rd) lot only coarsely ground. Then in a separate bowl( nonreactive- plastic or glass), mix the whole lot together. I do the tasting and “doctoring” when this is done. Add salt, vinegar or citric acid crystals as required. The mustard is then allowed to mature for another 24 hours, before bottling. I would recommend that you keep the bottled mustard for 2 weeks before using. Note: Different varieties of Mustard seeds give different flavors; some are more bitter than others. So use your judgement in the doctoring! Thank you Rohit for sharing!!! This entry was posted in Mustard and tagged Mustard, white vinegar. Bookmark the permalink.